When I look for themes, I always make sure that they are responsive because these days there are more and more people surfing the web using mobile devices. The good thing about WooCommerce is the fact that it runs on WordPress and as many already know, most WordPress themes are responsive in design. In fact, the stock theme that I used in this tutorial was responsive. I actually only decided to put together this list because the stock theme was a bit bland and would have preferred something that’s just a tad more appealing. 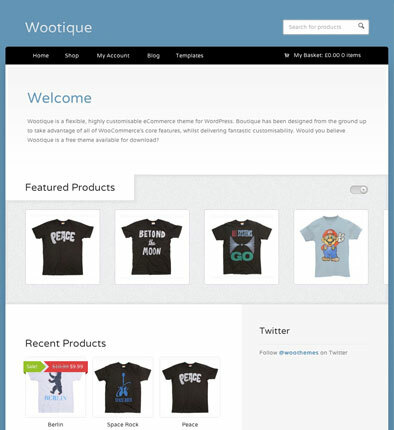 In addition to that, the theme wasn’t designed specifically for WooCommerce. 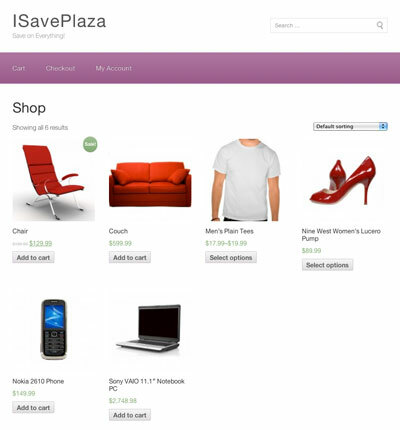 In the list below, you will find themes that were designed specifically for WooCommerce. While I tried adding only responsive themes to the list, I had to make an exception on the free ones because I don’t like to set the bar as high for them. As for the premium ones, all of them use responsive design. This theme is brought to us by Kadence Themes which offers Virtue as a free download as well as a premium download. If you look at the reviews on this one, you’ll see how popular it is and it’s actually no surprise since the theme does look very good and modern. I personally like the layout and close attention to detail. On the product listing pages you will see that the developer put quite a bit of work into it. The stars on the ratings have been designed to match the color of the theme, there is also a “new” label which matches. The add to cart buttons and options buttons also look nice. I also like that they designed the drop-down menus to look a bit more modern. The 1 column design looks good as well and makes the store look bigger. Since you may be wondering what the premium version offers (I know I did), you can find out more details here. In a nutshell, it offers some extras such as shortcodes, support from the developer, widgets such as Google maps, carousels, sliders and more. So I’m only on the second free theme and I am already impressed with what is being offered for free these days. This one I really like and I see there are many others out there that agree with me because it has a very good rating and has been downloaded quite a few times. The theme runs on the Helix framework and offers some nice features. The theme features 3 preset colors: blue, gold and what looks like fuchsia. I personally like the fuchsia the most but that of course this depends on the type of store that you’re running. In addition to color presets, shortcode generators and other extras are being included. 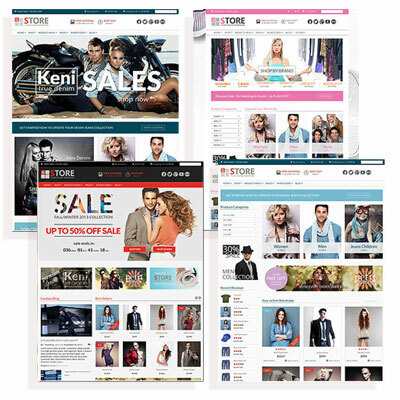 The homepage features a 1 column design and product view pages feature a 2 column design. Overall, this theme looks pretty amazing and it just raised the standards for the rest of the themes on this list. After looking at Vina Fashion, I was a bit worried that Panthea wouldn’t impress me much, but the mega menu did it for me right away. In addition to that, the theme features over 600 Google fonts and it lets you set the font size as well for titles, slogans, body text and more. You can even play around with this feature on the demo page. 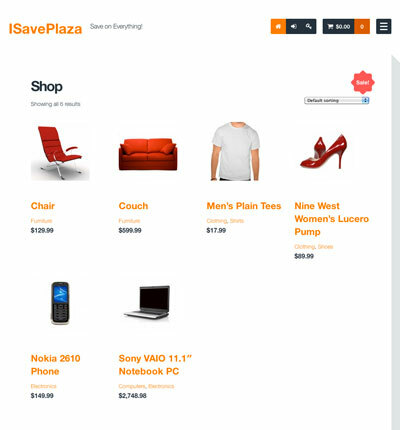 This theme also features a 1 column design for the homepage. 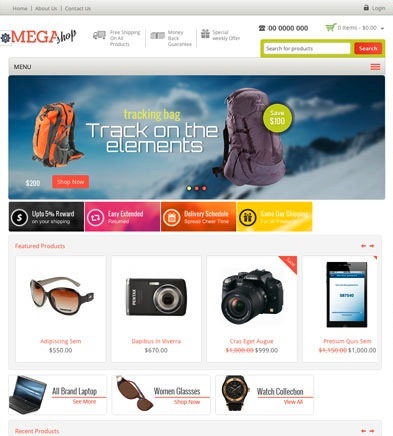 The category and product view pages feature a 2 column design. I am really amazed at how great the category pages look. I especially like the way the category and filter widgets were designed. The listings also look cool especially when you hover your mouse over them since that makes the add to cart and set options buttons appear. I like the overall clean modern look. It’s also simple yet fancy and doesn’t look plain when taking into consideration the basic layout and colors used. 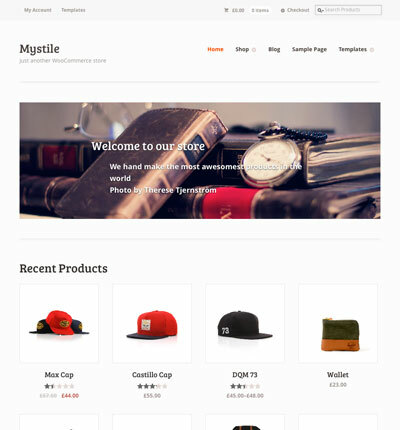 This theme comes from the developers of WooCommerce. The theme is actually built on the WooFramework which offers plenty of useful features such as the ability to: upload custom logos and favicons; choose your typography and styling; shortcodes for social links, buttons, content boxes and more. The theme itself is very creative and detailed looking. The demo products suggest that the theme would work great for a jewelry store but I can see this working well in other niches as well. For example, if I had a crafts store, I would likely use a theme such as this one. 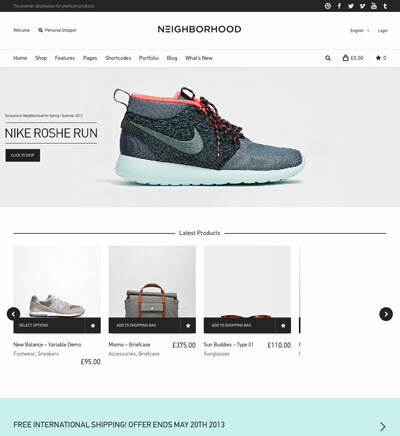 Their demo site uses a 1 column layout for the homepage and 2 columns for the product listing and product view pages. If you look in the top right of the featured section, you will also see a button which looks like a switch. This button triggers the slideshow effect. Unfortunately, this effect makes my screen shake since I am using Safari. I actually questioned whether this was done on purpose because the shake didn’t look clean. After testing the theme in Firefox, I realized that it was a bug that what causing it, because in Firefox there is no shake. In addition to that, the theme doesn’t seem to use a responsive design. As for the layout, the homepage appears to use a 2 column layout halfway down the page. The Category pages seem to use a 2 column layout and the product view page seems to use a 1 column layout. 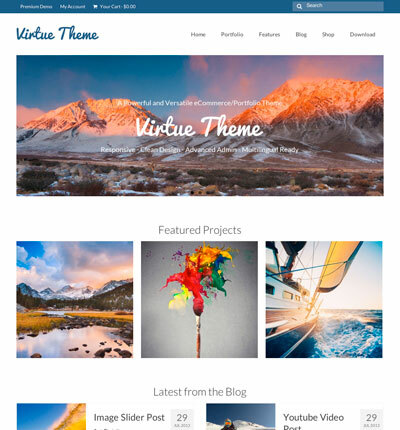 Here is yet another theme from WooThemes. The design on this one is simple but it’s not necessarily a bad thing since it has some nice little touches which gives it a bit of personality. For example, the orange links & icons give some pop. As for the layout, it seems to use a 1 column layout throughout the entire store. The developers state that the footer can hold up to 4 widgets so I guess it was designed that way due to the body having only 1 column. This comes in handy for products that require larger thumbnails. 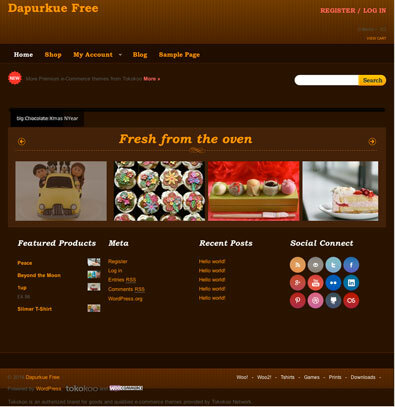 Here is a great looking theme for a bakery, candy shop or any other food related store. I like the design on this one as well as the pattern that is used for the header and footer. I also like the colors used for the social buttons since the colors remind me of candy. Overall, the colors blend well because while the majority of the theme is dark, the lighter colors help keep it from looking gloomy. Instead, they give off this warm home feel. While I believe the designer will take care of this eventually, I wanted to point this out for those of you that are planning on installing this theme on a live shop. Based on the error, it seems like this can be taken care of even without the designer’s help by simply making sure that you are using the latest version of jQuery. As for the layout, it uses a 1 column layout throughout the store. Interestingly enough, the sort menu on category pages is located at the bottom of the page. This theme is offered directly on WordPress.org so there wasn’t a demo that I could use for the photo. Instead, I installed the theme on my demo store. As you can see, the theme uses purple for the navigation bar which would work well in certain niches. When I first installed the theme, it looked broken but this wasn’t the case and managed to get it looking right by customizing it in my admin panel. I did this by going to “appearances > customize”. Since this theme is also located on WordPress.org, I had to install it on my demo store as well. 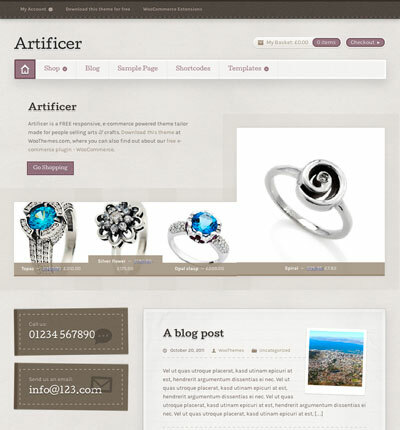 Overall the theme is pretty nice and was designed using HTML5 and CSS3. The theme has some nice customization options since it lets you choose the font and background colors for the icons and buttons. I also like the way the navigation bar follows you as you scroll down the page. 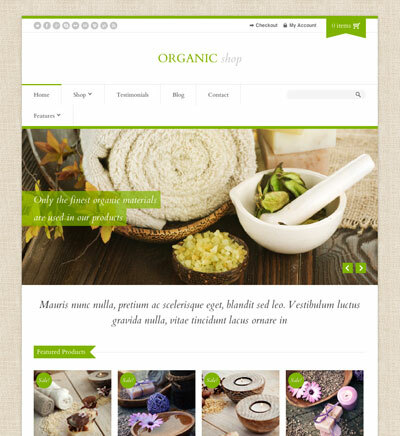 While there are many nice looking free themes available for WooCommerce, the selection is a bit limited. Of course, I can totally understand this since designer need to make money and they mostly put out the free themes in hopes of getting some exposure. I personally admire them for their hard work and am grateful for their contributions and hope to see more great themes such as the ones listed above in the very near future. However, for those of you that didn’t find what you were looking for above, take a look at some of the premium themes that I’ve found as well. The selection is a bit larger so it might be a bit easier to find what you are looking for. I decided to add GoodStore to the list because a) the designs are awesome and b) you get a lot for the money because it offers 16 predefined customizable styles. Which is great if you’d like to change the look of your store on a seasonal basis or for certain occasions. 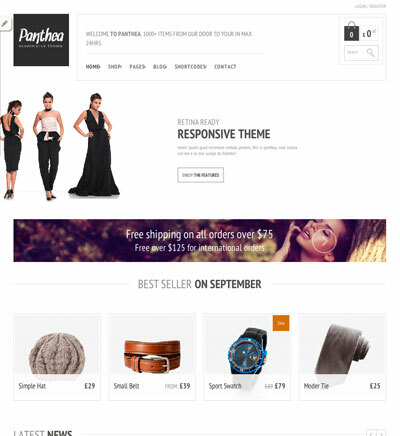 The theme also has a drag and drop page builder, a layout which lets you choose between 980px as well as 1170px, is SEO optimized, is retina ready, includes demo content and more. As for the extras, the theme utilizes HTML5 & CSS3, includes Google snippets which is definitely useful, is optimized for fast loading using CSS Sprite, includes a revolution slider and more. 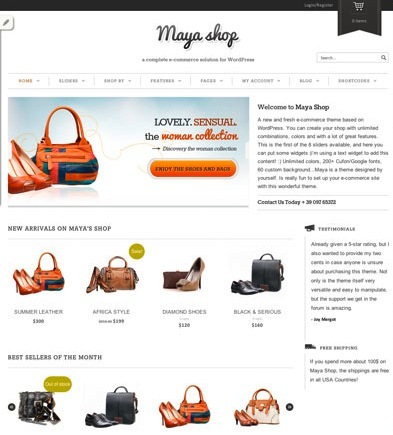 Two things crossed my mind while looking at Maya Shop… I first said, wow what a nice looking theme and only realized later that most of my attention was focused on the actual products and not on the theme itself. I guess these are the kind of reactions that most themes should trigger… Even while looking at the theme now, I can’t help but focus most of my attention on the actual products. The design is very classy and surprisingly enough, the black doesn’t make it look too dark which is usually all too common with dark themes. As for the extras, the theme features a stretched or boxed layout, 300 Google fonts + 20 cufon fonts, 8 sliders, is optimized for SEO and more. Here is a theme that would look good in a boutique or leather goods shop. I like how it gives off this luxurious feel while keeping things simple. A good example of how “less is more”… Speaking of more… It includes over 20 pre-built pages, 600+ Google fonts, an integrated wishlist, includes a swift page builder which lets you build your own pages using any combination of 40 elements and more. 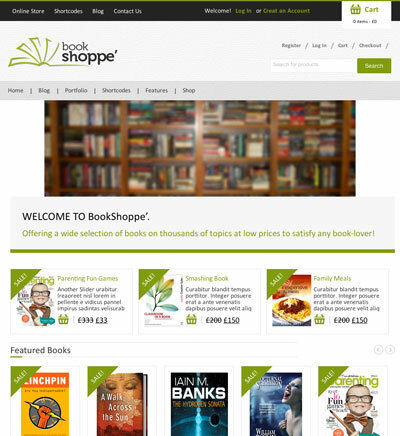 Here is a book store theme that uses HTML5 and CSS3. The design is clean, crisp & modern looking. The paper pattern background in the header definitely adds a nice touch and will really accommodate any bookstore nicely. As for the features, I personally like the featured author and best seller sections and bookflip slider, but there are many others — Google fonts & shortcodes to name a couple. 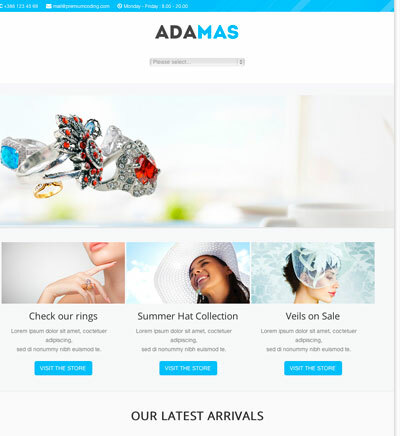 The Adams store theme will be sure to lighten up any store. While this theme would be perfect for a jewelry store, I can see it working well in a sunglass shop or other type of store that could use a fresh look. To me, the colors give off this nice feel of clarity. The theme includes an IOS drag & drop slider, fancy animations, page builder and more. 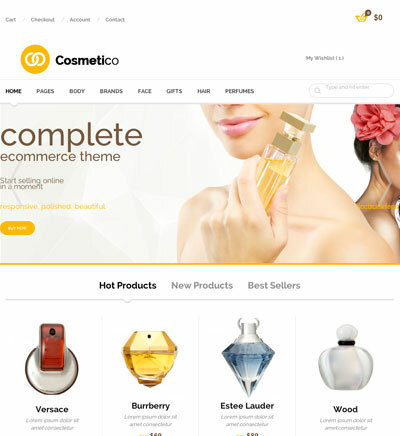 If you’re selling cosmetics, I think this theme is for you… I know I’ve looked at quite a few themes while putting this list together and believe that this is the first of its kind that I’ve come across. The colors were done really well and just by looking at it, I feel like I’m standing in front of a cosmetics counter at the mall — I can even smell the perfume… The design also gives off this solid feel. The theme includes PSD files, multiple skins, a page builder, 300+ vectors and more. 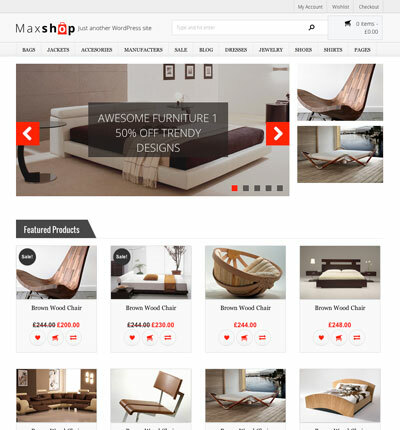 Maxshop has this nice contemporary look to it and would look great in a store that sells furniture or housewares. The theme is designed using HTML5 and CSS3, features a shortcode generator, 250 font awesome icons, HTML5 audio & video support and more. Here is a great theme for a health food store or store selling homemade soap, skin care products, candles or maybe even green products. I say this because the colors and overall look really give off this healthy, natural feel. Features support for flickr and Google maps, Google fonts integration which lets you choose and add fonts from here, includes PSDs which are fully layered and more. 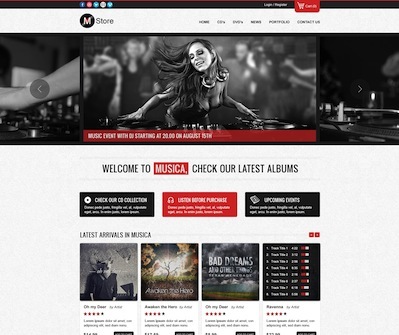 Here is a cool theme that is sure to be a hit for sites selling music or digital downloads. The overall design looks really good and I’m digging the background patterns and color combinations. I really like the way the designer thought of showing a playlist when you hover of the product images. If I was selling music, I’d likely get this theme. I also can’t help but realize how well this would go with a shop selling photography — mainly because the product images are nicely emphasized and displayed. Features video support in slideshows, fancy animations, different shop variations, an IOS drag & drop slideshow and more.